Back in December 2005, Presidents Hugo Chávez and Lula laid the cornerstone for the Abreu e Lima Refinery Complex in the Brazilian state of Pernambuco. The refinery was a $2.5 billion project, co-owned by PDVSA and Petrobras, and at the time both countries were booming. Brazil was selling large amounts of its commodities to China at an outrageous price, which helped sustain the expansion of the economy. Riding the wave of the commodity boom, Lula would frequently boast that growth rates like these were “unseen” in Brazil until then. Then, in 2008, the US housing market went bust. Lula actually said it was going to be “uma marolinha” – a little wave – and that Brazil was perfectly insulated against its toxic effects. On the heels of heavily triumphalist propaganda, in 2010 Lula managed to get Dilma Rousseff elected President in spite of her lack of charisma and her inexperience in running for office. The government’s marketing gurus sold her as an outsized manager – the “mother of PAC”, the Programa de Aceleração do Crescimento, which was the name given to Lula’s set of economic policies. We were told she would help Brazil continue on a high-growth path. The scenario in which Brazil was showcased as an emerging power capable of showing the US and Europe how it was possible to survive an economic downturn without going deeply into recession … proved to be a fallacy. Misallocated infrastructure resources and excessive government spending, along with a fall in consumer spending, giant fuel subsidies that heavily affected Petrobras’ books and made its stock price tank, and above all, a return of high inflation, all suggested that the “marolinha” had indeed become a tsunami. Dwindling resources did not improve the political situation. Several high-ranking Workers’ Party (the PT, Rousseff’s and Lula’s party) officials were convicted in the so-called Mensalão case for receiving monthly stipends in exchange for their votes in Congress. The ruling by the Federal Supreme Tribunal (STF) prompted leading PT figures to say the trial had been political, and that the STF had been influenced by “conservative” media. One wing of the PT resurrected a project for “social control of the press,” a euphemism that translates into censorship of the press that opposes the federal government. In light of this, chavismo’s heavy-handed approach to press freedoms is often cited as something Brazil has to avoid, along with the manipulation of the courts – particularly after the same court that convicted them decided to slap those involved in the Mensalão with light sentences. For example, Justice Joaquim Barbosa, the first black member of the STF, has vigorously defended the idea that those involved in the Mensalão should get the book thrown at them. Because of this, he is lionized by opponents of the PT, and is seen as a devil by its leaders. The specter of chavismo scares those who want Brazil to align itself with a clear conception of liberal democracy and respect for free markets. To them, the 2014 election is a crucial opportunity to defeat a PT clearly seeking to implement populist political reforms. The serious economic crisis in Venezuela calls into question Rousseff’s interventionist policies. Whether it is subsidizing gasoline and electricity á la Cristina Kirchner, or using development banks such as BNDES to finance mega-projects of dubious use for Brazil – such as the renovation of the Mariel port in Havanna. Many Brazilians believe that não há cafezinho de graça – there is no free lunch. There is a generalized fear that the bill for such splendid-yet-fiscally-irresponsible generosity will come up after this October’s election. 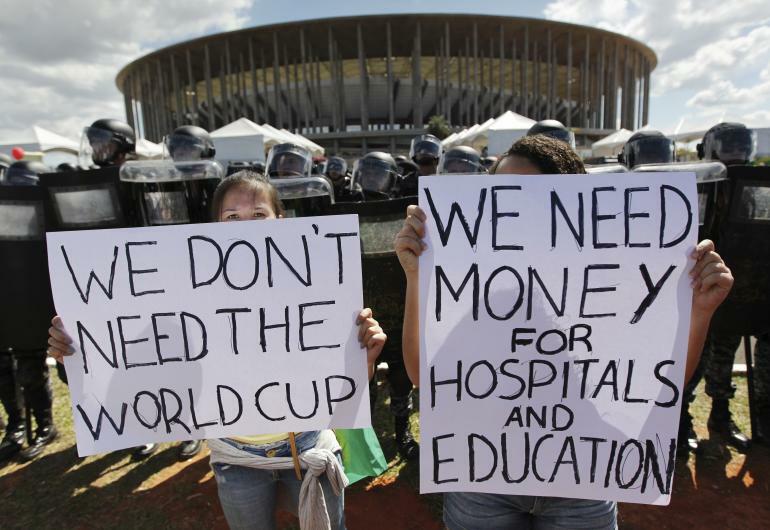 With so many misses and so few hits, it is highly likely that protesters will return to Brazil’s streets during June and July’s World Cup. What they want to know is why, if we can have 12 FIFA-quality stadiums, we cannot have schools and hospitals of similar quality. Venezuela’s economic crisis turns the warning lights on for the Brazilian government, as well as for vast sectors of society, mostly those who are better informed. Chavismo’s ferociously statist policies provide a sharp warning about what should not be done here. At the same time, it highlights the importance of preserving political spaces in Brazil, providing motivation for those fighting to prevent tighter controls on the press and a current project to restrict massive street protests. The Brazilian government may be an accomplice to Maduro’s actions against the men and women fighting in the streets of Andrés Bello’s native land, but most of Brazil’s better informed citizens are not indifferent to what is happening. I am personally invested in seeing Venezuela embrace free market economics and liberal democratic institutions. I see chavismo as hopelessly irreconcilable with these values. Radical sectors of the PT openly admire the chavista totalitarian project, and that is why events in Venezuela matter greatly for the future of Brazil’s democracy. Finally, it is worth remembering that PDVSA did not invest a cent in the Abreu e Lima refinery, and to this day it is still not in service.